The editors of Faithgirlz! 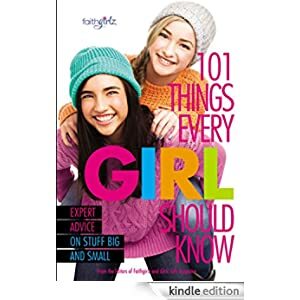 and Girls’ Life have collected their best advice to help girls take charge and feel confident in a variety of situations, from changing a bike tire to talking to your teacher about a bad grade, from being threatened by a bully to falling down the stairs at school. What do you do when you’re at a party and you don’t know anyone? What’s the formal way to set a table (and why does it matter)? This random collection of problem-solving strategies helps with everyday stuff, big and small. With tips, advice, and lots of humor, this is a book every girl needs. Suitable for ages 10-16, this book is selling today for only 99 cents.